Up and out by 6:30am. Heading to the airport. Once out of Gaziantep the roads were empty. For the first time in a week I dipped into the feeds. The more I read the more the refugee crisis in Syria felt like a bad dream. On Twitter It seems everyone back home is going crazy for Google Glass. I wondered how I would feel if I’d worn them in the refugee camps in Syria. Or if soon the aid workers might. I cant see it happening for a long time. You’d be a fool to wear them here. Even for safety reasons. Kidnap is not unusual in Syria these days. Not because these people are ‘evil fundamentalists’. It’s because they are desperate. Aid workers have been kidnapped and fear of abduction is one of the barriers preventing more emergency relief supplies getting in. 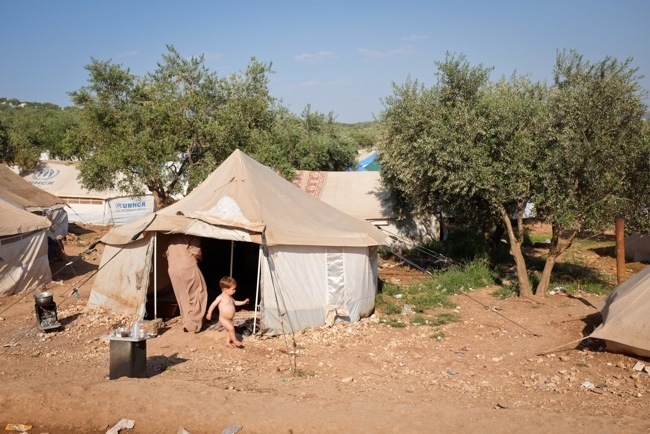 The Syrian refugees feel the world has left them to rot in makeshift camps. While the west carry on regardless. I’m really quite attracted to the benefits of wearable technology. Navigation, communication, all of it. But recently I felt uncomfortable just having my phone to hand. Not because I felt threatened. Because I felt obscenely privileged. The poor here don’t have enough to eat. Parents have to watch their kids slowly starve in between watching the skies for air strikes. With every leap forward we make technologically, we seem to be leaving some people further behind. I’m sure wearable technology like Google Glass can be used for real good. It’s just that the gap between the ‘haves and have nots’ is an increasing chasm and our technological advancements seem to be doing little more than highlighting this. I’m trying to imagine what the naked kid in the picture might think when approached by a foreigner wearing both a concerned smile and a networked ‘heads up display’ on their face. For some, It’s all getting very science fiction, very fast. And with all this communication to hand.. to face.. help still isn’t getting through. I frequently wonder at our human condition. Here I am in sunny Swindon and my immediate concern is how to make a business work so that I may pay a mortgage, help to feed my family, go on some sort of summer holiday and buy a gadget or two. The thing is I’m aware albeit at a distance of rotten situations in other parts of the world. At Christmas time I squirm at the over indulgence, the gluttony, the numbing effects of alcohol to deaden our senses. I hate the endless array of adverts which convince us we are less than human if we don’t have the latest in makeup, technology or toys. What do the very monied rich feel like, how do they perceive the world, what concerns do they have, what is on their mind right now? As a eleven year old I lived in poverty. I didn’t go to school, we had no money, people would leave us with food parcels so we could eat. Where I was at the time, there was no welfare state to protect us, Save the Children helped (at least mostly). The odd thing though was this, it was the locals, who were poor by any reasonable measurement who helped us the most. When my brother stepped on a nail we had no money to pay for a Doctor or a Tetanus injection and it was the locals who clubbed together and gave us £5 so we get a Doctor out to see my brother. We were front page news in many of the UK papers and yet the Government did nothing to help us. The people in England did nothing to help us. The monied rich did nothing to help us. It was the poor who had little that did help us. What does this tell us about the human condition? I’m not completely sure. Perhaps it takes one to know one. Perhaps, distance from a problem seems to make the issue almost invisible. Perhaps we are brought up to be so focused on the individual that we have little real time for others. In terms of my story, with no school, no money, no TV and the usual trappings of life. I think I was lucky to have had the experience. I was lucky we had great weather for a large chunk of the time. A local had a home she let us use before it was to be demolished. I lived near the sea and learned to swim. It was the only time I felt really free. We did eventually make it back to the UK where I very soon became consumed by a system of control. My best wishes to you and all humans. Hi Steve, Thank you so much for your heartfelt comment. I can certainly relate to much of what you say. Not the absence of school. I realise that I took my education for granted now. Thank you for sharing.